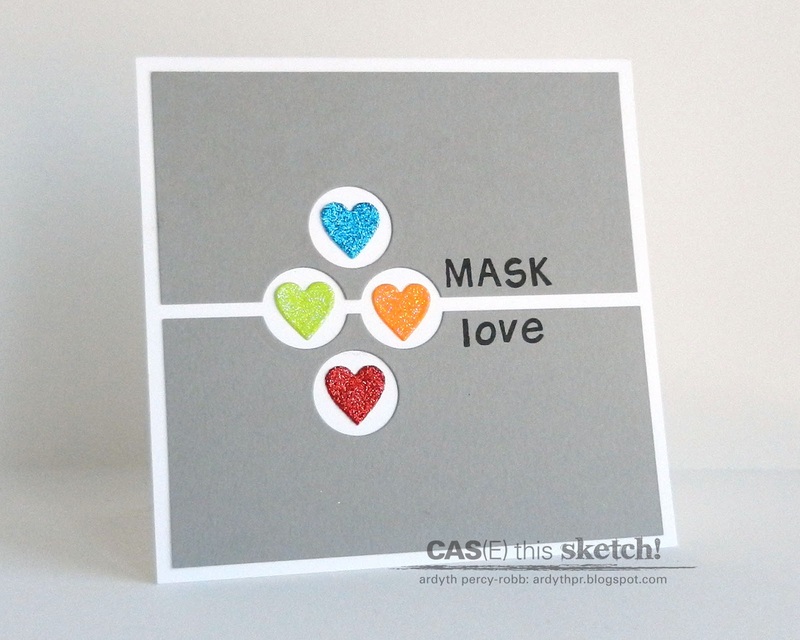 You probably find the word "MASK" a strange one to have one a valentine, but it is an acronym the first initials of our names, in age order (ie Michael, Ardyth, Struan and Kate) and the basis of the name of this blog. The four different coloured hearts represent the four of us (already the kids are fighting over which one "is them"!). This card will be for my husband. Now it's your turn - I can't wait to see how you interpret this fun sketch! Don't forget to link up by Tuesday at noon. The Design Team have some great examples here! OH so cute! Love those glittery hearts! So sweet! Love those hearts! Love the glitter hearts Ardyth! Such a fabulous graphic card. Your eye for color and graphics is divine. Love it. So cute! I love the sparkly hearts and your story of how you came upon the name for your blog, especially the analogy that you are the vowel that holds them together. How much do I love this...let me count the ways! This is so cute and the colors are AWESOME! What a great design!! WOW! How fun and how personal and how funny about the kids fighting over which one is them!! Love it! I remember reading your explanation for the name of your blog - so this is just a perfect card for your family Valentine! Love it! I was wondering what the MASK was there for! Glad you explained - what a great valentine for your DH! This is great...I love your hearts and the design is so fun. So so sweet! What a great idea to use negative space for those cute glittery hearts! Aww, such a sweet story! You know you've locked yourself into making 2 more of these, right? Love the thought behind your card. This is SO special!! What a sweet tribute to your family. Great idea to split the grey panels/two circles. You truly are cleverly creative! Clever design - love it! I love everything about this card. I especially like the way the hearts each sit in a punched circle...very clever and so gorgeous with those bright hearts.